Perimenopause is a normal and natural part of life and is not unhealthy in itself. However, it does often come with unpleasant side effects that can endanger health and well-being. These can include insomnia, weight gain, hot flashes, depression, anxiety, among others. These symptoms can have negative psychological and physiological effects, so it is important that they are dealt with as early as possible. As alcohol is a depressant, drinking too much is likely to lower your mood and leave you feeling run down in the long term. Caffeine, on the other hand, is a stimulant, and a high intake is likely to lead to or exacerbate insomnia. If you do already, it's never too late to quit. Smoking increases the risk of developing perimenopausal osteoporosis and has also been linked to heart disease. It also has visible negative effects, especially on the skin and teeth. Variety is also important here; eating a wide range of these foods will increase your intake of beneficial vitamins and minerals, elevating mood and reducing the chances of sleeping badly. Replacing unhealthy snacks with healthier alternatives will also help with the maintenance of a healthy weight, which can be helpful for women going through perimenopause. Dehydration can intensify perimenopause symptoms by leading to irritability and higher stress levels, and can also promote snacking when the body mistakes thirst for hunger. Water is essential for the brain to fully function, and it has positive effects both internally and externally. The recommended amount is 150 minutes of moderate intensity exercise each week; this means anything that gets your heart pumping a little bit faster. It doesn't have to be a chore - going swimming, riding your bike, and walking the dog all count. The good news is that any is better than none, so if illness or disability prevents you from moving too much, just do what you can. Exercise reduces symptoms of perimenopause by building bone strength, increasing mood, and promoting good sleeping patterns. Perimenopause can occur with an abundance of unhealthy side effects, but these can be managed. Taking a common sense approach to overall health and well-being, especially watching diet and lifestyle, means that perimenopause can be a healthy, comfortable transition that need not take its toll on your body. 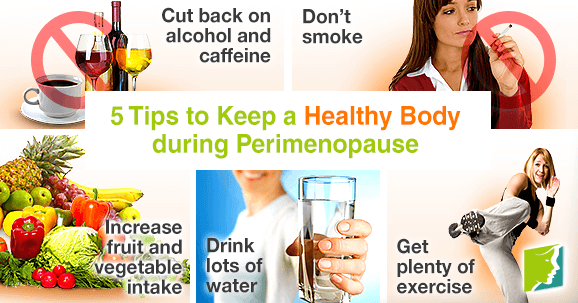 Read more about relieving perimenopause symptoms.